German tuning firm ABT Sportsline is no stranger to making powerful German missiles even more powerful. But what sets its latest creation apart from some of its past ones is that it’s coming to America. All 50 of them, at least. Meet the ABT-tuned Audi RS5-R Sportback. Not only is it coming to the US but only Americans will have the chance to buy one. Europe, this time America gets to have all of the fun. "There will definitely be no more than 50 cars,” the tuner claims, but sometimes demand creates the temptation to build more because there’s money to be made. ABT has boosted output from the 2.9-liter twin-turbo V6 for a new total of 503 hp and 509 lb-ft of torque. 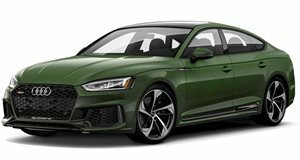 To compare, the stock RS5 Sportback produces 444 hp and 443 lb-ft.
All that power is distributed to all four wheels through an eight-speed automatic transmission. The fastback sedan has also been given a height-adjustable suspension and sports stabilizers so that it can handle the twistiest roads owners want to tackle. The tuner has not confirmed specs such as top speed or final pricing, but don’t ask questions you don’t want answers to because you can’t afford the response. Put it like this: Aside from the performance and handling mods, ABT also added plenty of carbon fiber add-ons, such as weaved lip spoilers and winglets. There’s also a new four-pipe exhaust system and 21-inch wheels. All of that adds up when it's time to write a check. Given that the pricing for the stock RS 5 Sportback begins at over $75,000, the RS5-R Sportback is likely to cost quite a bit more. The few interior shots released also show additional carbon fiber trim on the gearshift and seat control surround. ABT also adds that all of its modifications come with a four-year or 100,000-mile warranty. We can assume that’s in addition to the manufacturer’s warranty unless, of course, it’s void the moment one modifies the car.